A new ICU at Emory Midtown sets the standard for all critical care in Emory Healthcare. It incorporates feedback from families and former patients with technology to make care teams more efficient. As part of an academic tertiary care center, Emory University Hospital (EUH) and EUH Midtown treat large numbers of patients with highly complex medical conditions. Coupled with the fact that Atlanta metro's population is graying, critical care needed to take center stage. Buchman directs the Emory Center for Critical Care, which integrates all of Emory's critical care units and staff to achieve better patient outcomes at lower costs. One of the cornerstones of his plan was a brand new ICU at EUH Midtown, which opened on 11-South in late May. Buchman's team outfitted each room with a sofa, armoire, and computer desk. The advisers also told the team that they didn't want to be separated from their loved ones, so there are no curtains that draw around the beds. The ICU also features quiet care. "Go into the average ICU today, and the first thing you are assaulted by is noise," says Buchman. "Of course, it is important to receive and respond to alerts. But instead of putting the alerts next to the patient, let's send them directly to the caregiver." Monitors in the new ICU send alerts to workstations or a "voice badge" that nurses wear on lanyards to help them monitor patients as they move about the unit. Even the flooring throughout the unit and in patient rooms is soft and mutes the clicking of hard-soled shoes. 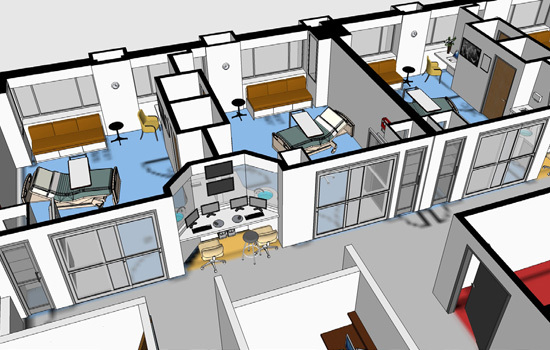 Nursing workstations are located between every two rooms, with wide windows into the rooms. Each room has a camera to send images to a team theater where health care providers can gather for team meetings to assess patients' progress. The design ideas also will be incorporated in a new bed tower planned for EUH—where more than half of the 210 beds will be devoted to critical care. EUH Midtown also built a ramp to connect its operating suites to the ICU so that postoperative patients can travel from one to the other without needing an elevator. The Center for Critical Care also is extending its reach beyond Atlanta. In early May, it was awarded a $10.7 million grant from the federal Centers for Medicare and Medicaid Services to support telemedicine ICU services in rural north Georgia hospitals. Emory—along with Saint Joseph's Health System, Northeast Georgia Health System, Southern Regional Medical Center, and telemedicine provider Philips Healthcare—will bring more than 40 critical care providers, including 20 nurse practitioners and physician assistants, from local hospitals to Emory for six months of advanced training. The rural hospitals also will be supported by audiovisual equipment that will allow critical care providers to consult with an ICU physician and critical care nurse. The telemedicine system is expected to save more than $18 million over three years. Redesigning critical care now is of particular importance since Georgia's population is growing older. According to the U.S. Bureau of the Census, Georgia is among the top 10 states expected to have larger than average growth in residents aged 65 and older by 2030. That growth translates into one in five Georgia residents older than 60 by 2030, yet demand for critical care physicians will outstrip supply as early as this year, says Buchman.